As a young lad, in the early 80's, I borrowed a book from the library, that had drawings of all kinds of strange mechanical devices. I can't remember, what book it was, or who wrote it. But anyways, one specific drawing got me hooked. It presented a simplified version of an automatic transmission. It had those ring, planet, and sun gears. Gears were changed by applying brakes on ring gears in certain order. I couldn't fully understand it, but regardless of that, I was still baffled and excited about it. Of course, there was no way of producing any of that to physical form back then. Very laborious way, and also very tedious to say at least. But let's get back to the present day. When I got the 3d-printer, I started to search drawings for similar, simplified version of an automatic transmission on the net. 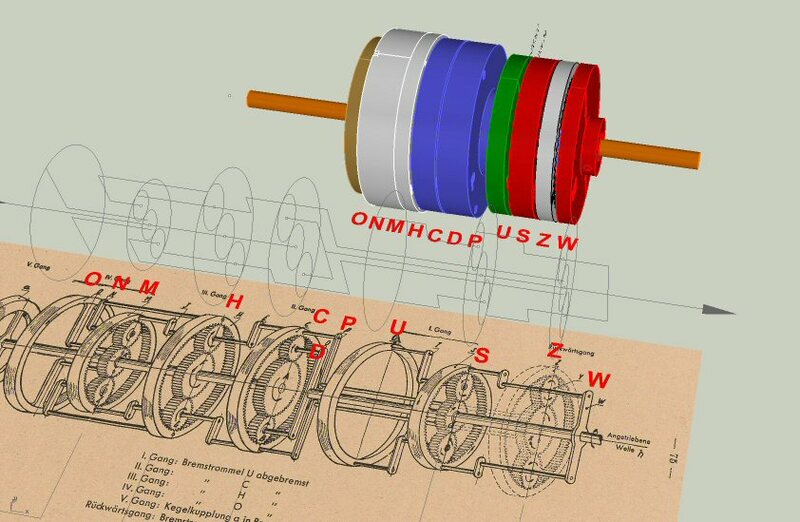 On that site, there is also a very hugely sized cad drawing of that transmission, but I haven't been able to find any of the actual linkages between the gears of that drawing. Wow - that is quite a mechanism! Something that I also remember seeing drawings of, but never really following well. Like you say, nothing like having one in hand to spin and study. I'll be very interested in how this progresses! A very cool & ambitious project. Trying to figure out gear trains makes my head spin. Looking forward to your progress with this. You're off to a great start & doing some really nice work. This page (and the embedded video in particular) might help clear up how it works. The only thing that's not obvious is which shaft is rotating at the input end, watching it a few times should make it fairly obvious. Great video, explained a lot - thanks for that! or worked for Bunkie Knudsen and Henry Ford Sr. on the 1915-1923 Model T. It had a planetary box with three brake bands. 2 speeds forward (slow and too fast) 1 reverse, brakes rear wheels only, with skinny tires, wise people carried an anchor to toss out if in hilly country. AdeV, thanks for the link. That Ravigneaux gear set is definitely much more compact, than the one I'm working on. Fig.3 shows the number of teeth of the gears, and that's pretty much all, that I need to draw a 3d-model of it. And yes, the PLA plastic, that I use for printing, isn't really the best candidate for parts, that face friction between one another. It tends to get warm, and therefore galls fairly easily. Somewhere I read, that boiling the printed parts in hot water might 'anneal' them to some extent. It would also shrink the objects, so not sure about that. Great video Ade. Here is another very oldie but goodie simple explanation of how differentials work. This one even a dummy like me can understand. Oh. My. That is some SERIOUS Meccano work! Hi All ..Didn't Isigonis figure out the Mini gearbox with Meccano ?? I've seen a couple of videos on YouTube, actually Army training films, that you might want to check out. The M47 Patton tank used a planetary gearbox and one of the videos is specifically about it. The other is just a general explanation, probably for the mechanics of the day? When I did a YouTube search for M47 planetary gearbox, those were the first two items listed. I watched the M47 video, and there was so much good information, that at least for me, it takes some time to digest it. What comes to the current gear set that I'm working on, I'm not sure yet, which sun gear is attached to the center axle, and therefore delivering torque from the motor to the rest of the gear sets. I'll have to modify the drawings to make room for the'K' to have the grub screw. Not a big deal, as at the beginning, I just wanted to get the gear sets printed out, and while assembling, make changes as is necessary. Some of the gear sets were way too tight to fit together, so I printed consisting planet gears with 0,1mm offset, to make them rotate more freely. Hi Sorveltaja, I am on dangerous ground here. As you know, unlike most mechanical engineers, I used thermodynamics all my life but left gears in the lecture theatre, oh so many years ago. But I am guessing it is A. My reasoning is like this. Gear ratios are changed by applying brake bands to the ring gears, or the one plain one. K is attached to the plain one so is sometimes stationary, while the engine keeps running. So A or F. If I am seeing the letters correctly, F rotates the opposite way to the engine, so it must be A. And of course we can see that the final output is through the Gang I set which is off the right hand side of the drawing. I believe what what you have illustrated is also known as the Merritt-Wilson gearset. It was used on numerous British and American tank and armoured vehicle transmissions. It was also used in the Wilson preselector gearbox (motor racing) and other makes of upmarket motor vehicle, like Damler etc. The particular advantage of the Merritt-Wilson gearset was the fact that the various gear ratios were selected by applying band brakes to the various epicyclic stages. A band brake is so much easier to make and maintain than a multi-plate clutch. 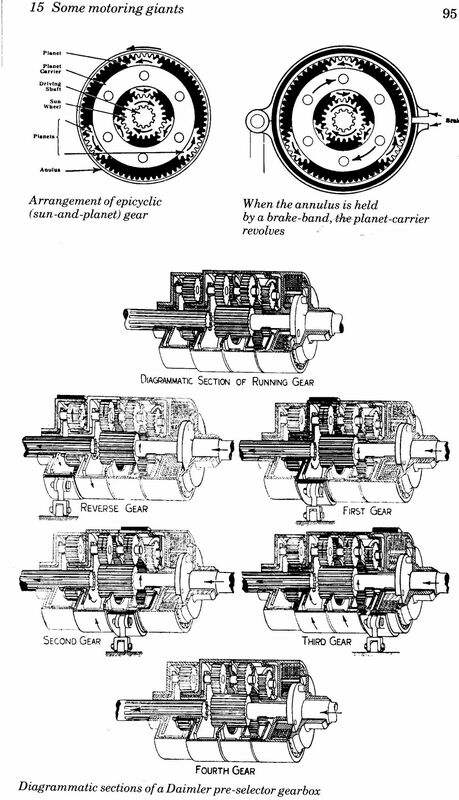 This illustration of the Daimler version, shows the flow of torque through the gearbox as each band brake is applied to select the different gear ratios. I found it useful to print a copy and colour in the torque flow path for each of the gear ratios. Hopefully this diagram will help you understand the operation of your illustrated gearbox. I have experimented with and designed Merritt- Wilson transmissions for one of my 1/6 scale model tanks. My design was based ion the epicyclic gear clusters extracted from 3 speed Sturmey- Archer bicycle gear hubs. Still easily available, tough, robust and virtually indestructible. If I knew how, I could post a DXF file of my 4 speed and reverse Merritt-Wilson transmission. If you are interested and provided someone can tell me how to, I could post the DXF files of my 4 speed and reverse Merritt-Wilson transmission. For me the complex part is figuring out the gear ratios on a single epicyclic (planetary) gear train. For me, if I can figure out one it's fairly easy to treat them as a unit and stack them together. Also, braking each part of the system or freezing various parts together become feasible to calculate. But tricky to figure out one epicyclic gear train. I found this in a machine design book years ago and have used it to calculate epicyclic gears since. Don't have the book here so I hope I can reproduce it correctly. I'm sure many of you have seen this so if I've gone wrong please let me know so I can correct. For this analysis assume the sun gear is fixed to the ground. Also, that the carrier rotates (if it doesn't its a simple gear train and not too hard to figure out). The scheme is to analyze the system in two steps. First FIX the carrier arm, it rotates zero rotations. Then un-fix the sun gear and rotate it one revolution (+1). This is now a simple gear train with the carrier fixed, so determine the rotation of the other gears (planet and ring). 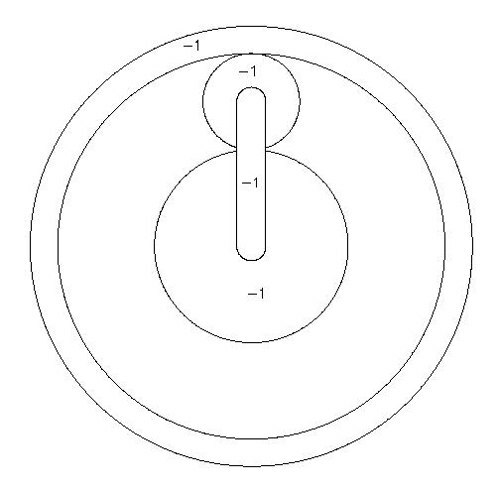 For this example the sun gear rotates +1, the planet rotates -2, and the ring gear rotates -1/2. The second step is to freeze all the gears and carrier together, all rusted up. Then rotate each element though -1 revolution. So the sun goes -1, carrier -1, planet -1 and ring -1. 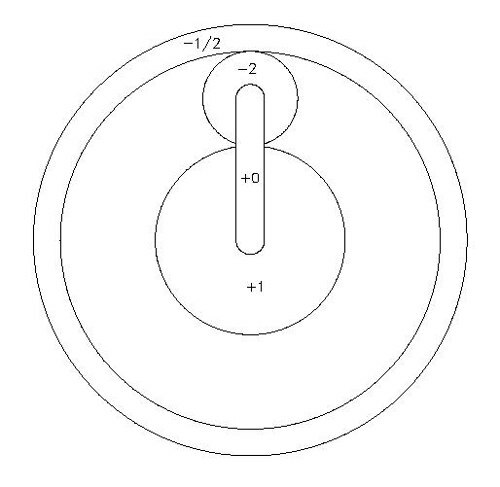 The final step is to add up the rotation for each element found in steps one and two. The sum has the sun gear with zero rotation, which it must have as, in reality, it's frozen to the ground. The other sums give the correct epicyclic rotations. If the carrier is rotated backwards one revolution (-1) then the planet with rotate -3 revolutions and the ring gear will rotate backwards 1.5 revolution (-1.5). 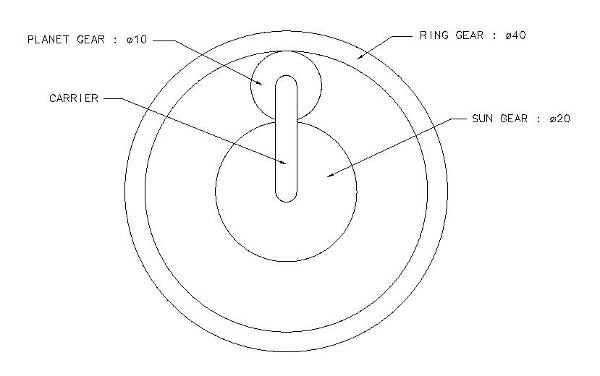 One rotation of the carrier thus produces 1.5 revolutions of the ring gear. Bob's your Uncle. Bad Behavior has blocked 15121 access attempts in the last 7 days.